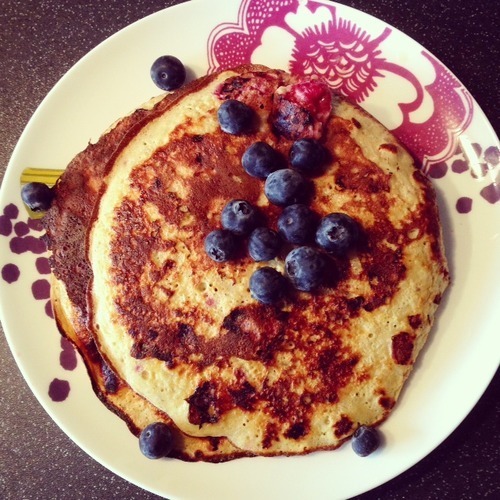 Everyone’s going mad for pancakes at the moment and quite rightly. They’re delicious with sweet or savoury toppings and they make the best brunch ever. But they’re not always the healthiest choice on the menu, especially if you’re trying to eat gluten free or dairy free. 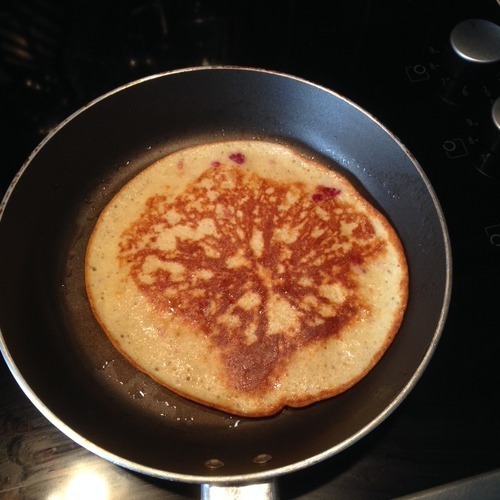 So here’s my never-fail recipe for healthy and nutritious pancakes, I promise that once you try these you won’t miss the ‘normal’ ones! 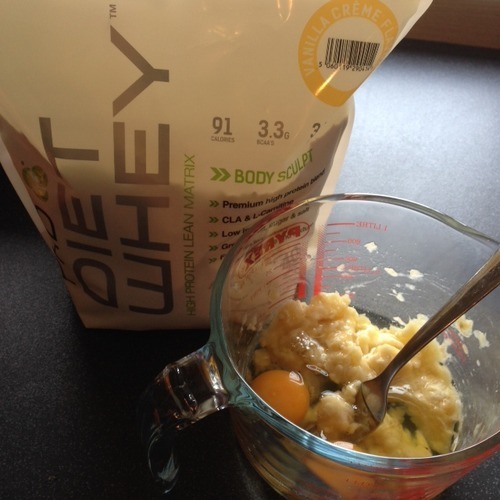 Peel and mash the banana with the 2 whole eggs until the mixture is batter-like. At this point you can add in your half scoop of protein powder (I find that vanilla works best) and your berries (I used raspberries). 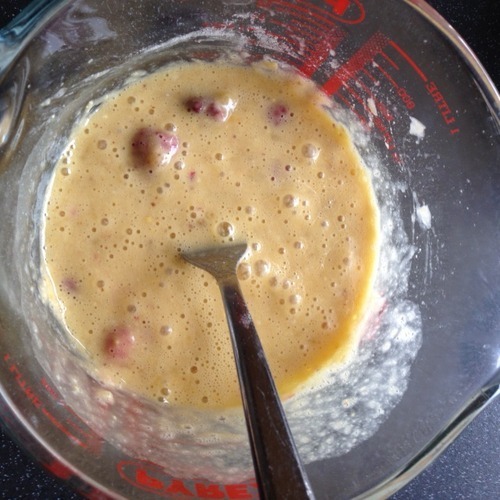 Mix the batter again to make sure all of the protein powder is mixed in thoroughly. Just like with normal batter, leave it to thicken for 5-10 minutes in the fridge. In the meantime melt the coconut oil in a small frying pan but watch out, coconut oil gets smoking hot very quickly! Pour a 3rd of the mixture into the pan and swirl the pan to make sure you’ve got a nice even spread. Once the mixture starts to bubble slightly on top flip the pancake with a spatula and then it should only need 45-60 seconds on the other side. 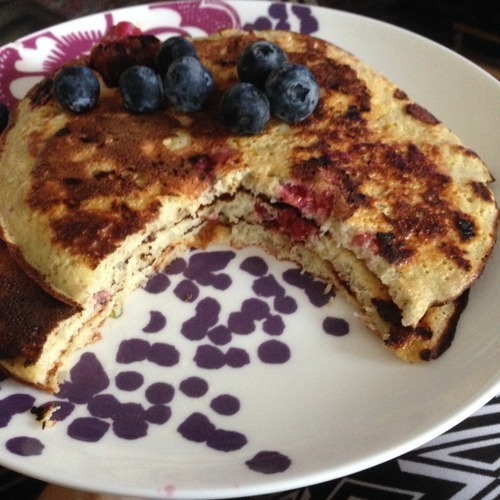 These were mine the other morning simply with some added blueberries. Amazingly, this photo has gained the most likes out of any of my posts on Instagram… Just goes to show the power of pancakes!